After three weeks on standby in Gateway Marina to the south of Brooklyn, Franck Cammas and his men have today snatched what is a great opportunity to attack the North Atlantic record. Sylvain Mondon from Météo France, onshore router has this to say: "Groupama 3 set off this Wednesday evening in a 20 to 25 knot S'ly wind. A line of stormy squalls from the SW hit New York during the course of the afternoon and produced a considerable wind increase on its way through. This enabled us to take the start a little earlier than we initially planned." The weather window opening ahead of Groupama 3 is forecast to see some stiff conditions and a steady rhythm, which will certainly appeal to Franck Cammas and his crew! 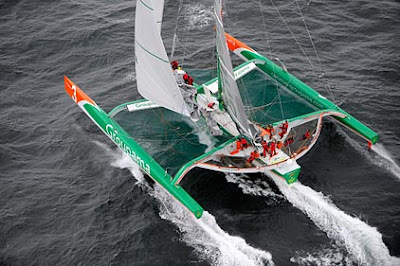 Record held by Franck Cammas, aboard Groupama 3, since 23rd July 2007.